Last week on Facebook, Delish re-published their dill pickle bread recipe from May 2017. I wasn’t following their feed back then, so it was all new to me! Only days before, I had been having a conversation with a friend of mine about how she stretches the use of the dill pickles that I give her for Christmas by also using the brine. 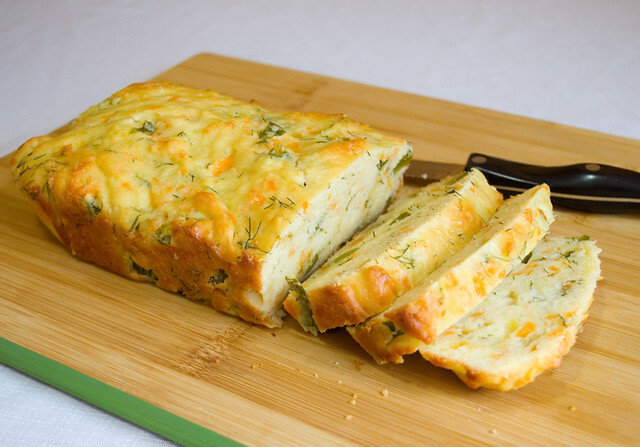 When this recipe popped up, I knew I had to make a loaf of dill pickle bread for her — and one for myself too, of course. The only changes I made to this recipe were to use lactose-free cheddar and sour cream instead of the regular kind. I was worried that this would mess with the consistency a bit, but from what the instructional video shows it’s a very thick batter that doesn’t rise much anyway. If that’s what was intended, that’s what I got! The end result is a very heavy (heavier than whole-wheat banana bread), very savoury quick bread. I paired it for one breakfast with eggs over easy, but the pickle flavour completely overwhelmed the more delicate eggs. I would suggest eating it by itself, either plain or toasted with salted butter, or with more potent deli meats such as salami, pastrami, or Montreal smoked meat. If you love dill pickles, you’ll love this bread — but if you’re only a little on the fence, there’s a good chance you won’t like it at all. Don’t say I didn’t warn you. Posted on April 4, 2018 April 4, 2018 by owntwohandsblogPosted in CookingTagged bread, cheese, delish, easy, homemade, pickle, pickles, quick bread, quick breads, sandwich, simple.